Par. 37.1 Energy audit of the company is the procedure to carry out detailed and validated calculations for the proposed projects aimed at improving energy efficiency and providing information on potential energy savings. Who has to perform the audit? achieved an annual net turnover from sale of goods, products, services and financial transactions exceeding PLN equivalent of 50 million EUR and total assets balance composed for one of these years exceeded PLN equivalent of 43 million EUR. should be based, as far as possible, on the analysis of the life cycle cost of the building or group of buildings and industrial installations, not on the payback period, to take into account energy savings in the long term, residual values of long-term investments and discount rates. What subjects to an energy audit? What obligations are imposed on the entrepreneur? 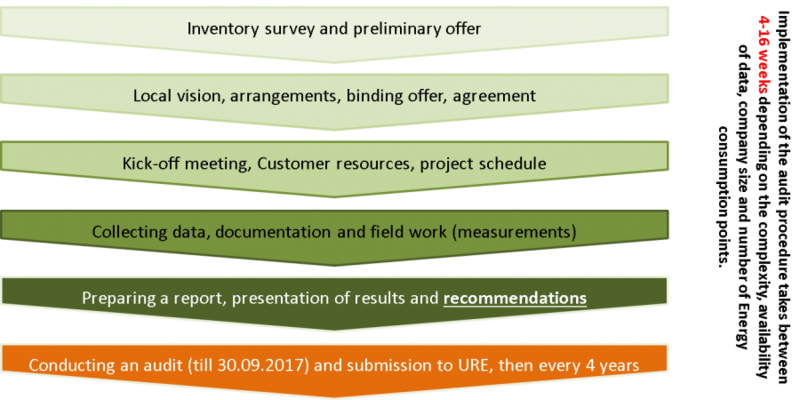 Implementation of the first energy audit up to 30 September 2017. Notification the President of the Energy Regulatory Office about conducted energy audit within 30 days of its completion. Affixture to the notification information about possible to achieve energy savings resulting from the audit. Storage, for control purposes, the data related to the audit for a period of 5 years. Repetition of the energy audit every 4 years. Energy audit is carried out according to a strictly defined schedule. Why is it worth to carry out an energy audit in the enterprise? Statutory obligation - a penalty up to 5% of revenues from the previous fiscal year for failure to conduct an audit till 30.09.2017. Identify weaknesses - identify critical areas of energy management for improvement. Recommendations - identify and develop in terms of technical and economic projects that improve energy efficiency. Savings - the result of execution of the full auditing and projects is to achieve savings (both on eliminating waste and potential income). Power Management System - an energy audit is largely a contribution to the documentation of ISO 50 001. The standard specifies the requirements, a common methodology and results of energy audits. It applies to all types of companies and organizations, energy in any form and all methods of energy use, with the exception of private dwellings. In the standard are given general requirements common to all energy audits. Detailed requirements of the energy audit complement the general requirements and have been published in separate parts of this standard, dedicated for energy audits of buildings, industrial processes and transportation. Energy audits according to PN-EN 16247 are the systematic monitoring and analysis of the use of energy consumption, building, system or organization, aimed at identifying energy flows and the potential for enhancing energy efficiency and their reporting. Statutory obligation – a penalty up to 5% of revenues from the previous fiscal year for failure to conduct an audit till 30.09.2017. Identify weaknesses – identify critical areas of energy management for improvement. Recommendations – identify and develop in terms of technical and economic projects that improve energy efficiency. Savings – the result of execution of the full auditing and projects is to achieve savings (both on eliminating waste and potential income). Power Management System – an energy audit is largely a contribution to the documentation of ISO 50 001.